Purchased cheese tortellini teams up with our delectable rosé sauce for this delicious weeknight entrée. This easy-to-make baked pasta casserole recipe is sure to become a new family favourite. Melt butter in large saucepan on medium heat. Add garlic and herbs; mix well. Whisk in flour; cook 1 min., stirring constantly. Gradually stir in milk; cook and stir 2 min. or until thickened. Add chili sauce and tomatoes; stir. Cook 6 min., stirring frequently. 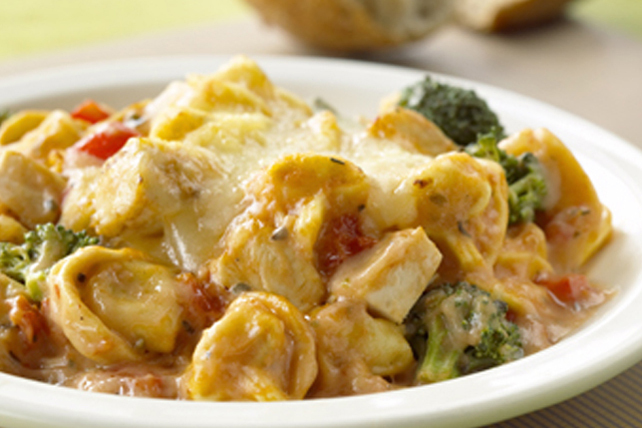 Add tortellini, chicken, broccoli, peppers and half the cheese; cook 2 to 3 min. or until cheese is melted, stirring frequently. Spoon into 1.5-L casserole dish sprayed with cooking spray; cover. Bake 30 min. Sprinkle with remaining cheese; bake, uncovered, 15 min. or until casserole is heated through and cheese is melted. Spray foil lightly with cooking spray before using to cover the casserole before baking.